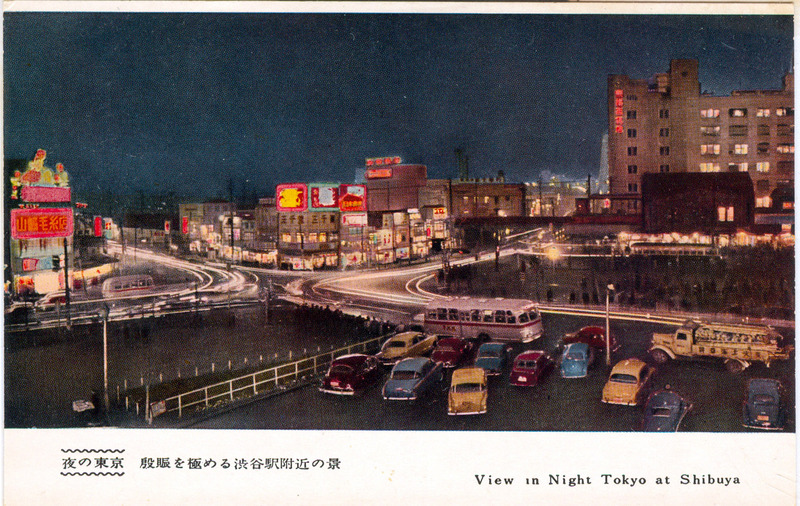 Night view of the southwest corner of Shibuya Station (within Tokyu department store) at the intersection of the Shibuya and Uda rivers, c. 1960. The Shibuya River curved towards the south of central Tokyo and discharged directly east to Tokyo Bay. The rivers were paved over in advance of the 1964 Tokyo Olympics, when the area was drastically altered to make way for the National Stadium and its access roads. Today’s famed Shibuya “scramble crossing” now sits at this spot. 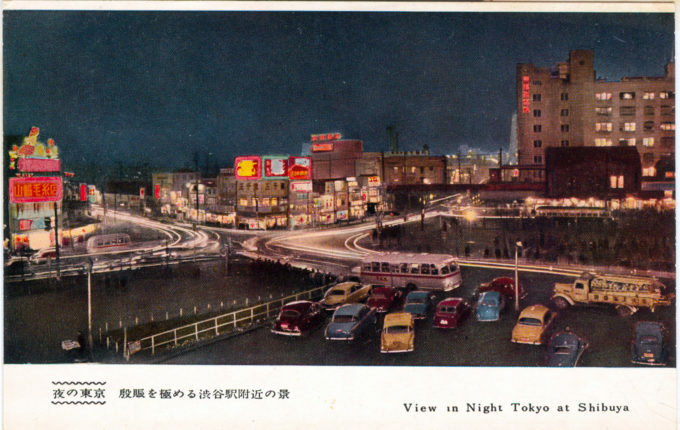 “[H]ow many Tokyoites are aware of the rivers they cross every day? (A quick survey of friends suggests not so many.) The Wakaba shōtengai [shopping street] is but one example and many other shōtengai were also once rivers. Shibuya’s main drag, Center Gai, and Harajuku’s Cat Street are other examples. The rivers that run under each, the Uda River and the Shibuya River, converge under Shibuya’s famous scramble crossing. It makes sense when you think about it: whenever heavy rain falls on the capital, domestic TV stations send their camera crews to Shibuya for footage of taxis sloshing through flooded streets.